Once your Walt Disney World planning is done, all that’s left before departure is the packing. For some, that’s no easy task. 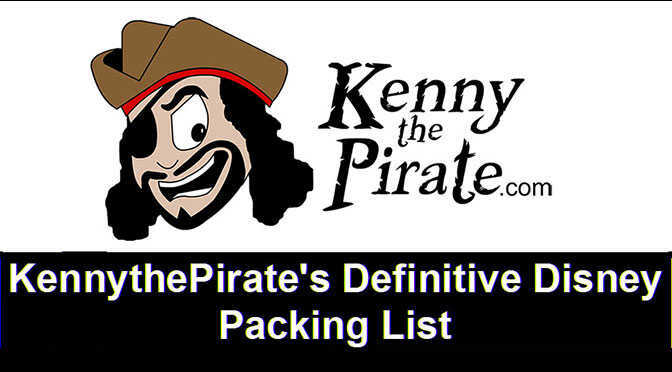 However, with this Definitive Disney World Packing List, I’ll help visitors take care of it with no problem. Wondering what the essentials are? What to bring and what to leave at home? This guide has the answers. Follow my tips for effective packing to save time and make vacation stress-free — just the way it’s meant to be! With airlines charging steep fees for overweight baggage, you need to account for every ounce when packing. Start with a piece of lightweight luggage so there is more weight to work with, then pack smartly. Roll clothes to take up less suitcase space (bonus: rolled clothes are less likely to wrinkle). Pack smart and don’t bring your entire wardrobe. We are all prone to over-packing. That last shirt you added? Take it back out. The strappy sandals that only match one outfit? Put those back in the closet too. Pick a general color, stick with it and make it central to your vacation wardrobe. I’m a big fan of souvenirs. Huge. So, I add an expandable bonus bag to my lightweight suitcase. It (somewhat) goes against my rule of striving to pack light. But purposefulness wins out here. I generally bring a backpack with me; I can use it at the park as well as on the way home. Be sure to pack one with minimal zippers. Having to unzip multiple zippers each time you go through security will get old. Trust me. Don’t leave the hotel without sunscreen, sunglasses and hand sanitizer. All three are indispensable items. I like lobster, but I don’t like to feel like one. Lather up with sunscreen before going to the park, and reapply often. The Orlando sun is unforgiving and a sunburn will make even the Happiest Place on Earth a drag. Everyone will also appreciate their own pair of sunglasses. Squinting at the sun is a quick way to a headache and makes for unfortunate photos. Hand sanitizer is recommended because, lets’ face it, there are a lot of germs around. A small travel size bottle is an easy way to keep clean. To make the most of your day at Disney World, ditch the purse and use a backpack. More useful and more comfortable to carry, a perfectly-packed Disney day pack will save money and stave off meltdowns. Along with the necessary basics mentioned above, pack these items: ponchos, snacks, refillable water bottles, lip balm and band aids. Kid-friendly additions include wet wipes, autograph book and sharpie, juice boxes, and glow sticks for the parades and firework shows. In this digital age, electronics are no longer optional — they are essential. A smartphone makes navigating Disney World parks super easy. After subscribing to Character Locator which will provide you with full schedules, wait times and soon will offer Touring Plans, download helpful apps like Disney’s My Disney Experience to adjust those Fastpass+ reservations. Bring an external phone battery, too. Between the apps and the photos, you will zap your battery. An external battery has saved my day more than once. A digital camera is another electronic must. With so many memories to snap, a large memory card and extra camera battery are ideal. Click the image below for a FULL size view. I’ve included a link below the image to the pdf version as well. You can save the image to your computer or phone or print the image or pdf. Be sure to share with your friends on Facebook and Pin the image on Pinterest so others can receive the same planning help! What items are vital for your vacation? Let us know in the comments. Happy packing! The tips above are courtesy of Ashley Dickey who is Reserve Orlando‘s travel expert, visiting Orlando to find the best travel tips, money-saving deals and insider information. With over 10 years of experience in first-hand-travel adventures, she shares her stories, advice, and current events to help you stay in the know. The pre priced USPS boxes and tape to send things home instead of lugging another bag home at the airport. Print label at hotel and ship to self. It’s to put a check mark by the items as you are packing them, both to take ON your vacation when you are home, and to take AWAY from vacation to go back home when you are packing to leave. I’m figuring the answer will be obvious once you tell me (you know, duh? why didn’t I think of that? ), but what are the Home/Away columns for?